Last week I bought my new mobile and I got a Nokia N73 phone. After the first days playing with themes and ring tones, as usual with new toys :), I installed Flashlite 2.1! I must admit I never used and seen it before… so I decided to make a first quick experiment making a simple game. Lucky that Adobe Device Central CS3 has just been released, so I could test the swf in different environments (even if I didnt understand how phones flashlite versions could be changed in the device central phone list..). 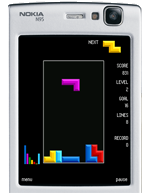 Anyway, finally I made this simple tetris remake with flashlite 2.1. So, why not trying to make something also with python? After installing tons and tons of software from Nokia, tutorials and example files I finally managed to start creating simple apps. Also this time I started with a simple game (my second fav arcade game): Asteroids. Anyway, please note that this is incomplete, it’s merely a test just for understand the python graphical api from Nokia.